TimeTrak is an agile job measurement solution that allows your construction business to manage all costs associated with a job or project, and invoice for a percentage of the overall job. Once you have quoted for the work you are going to do, for example, 100 metres of footpath, you are able to measure how much of the job has been completed and make a progress claim against that from within TimeTrak Mobile. This feature allows you to set a quote line within TimeTrak that may have no real relationship to the actuals (materials, equipment, labour, etc) but that is able to be measured and claimed against. 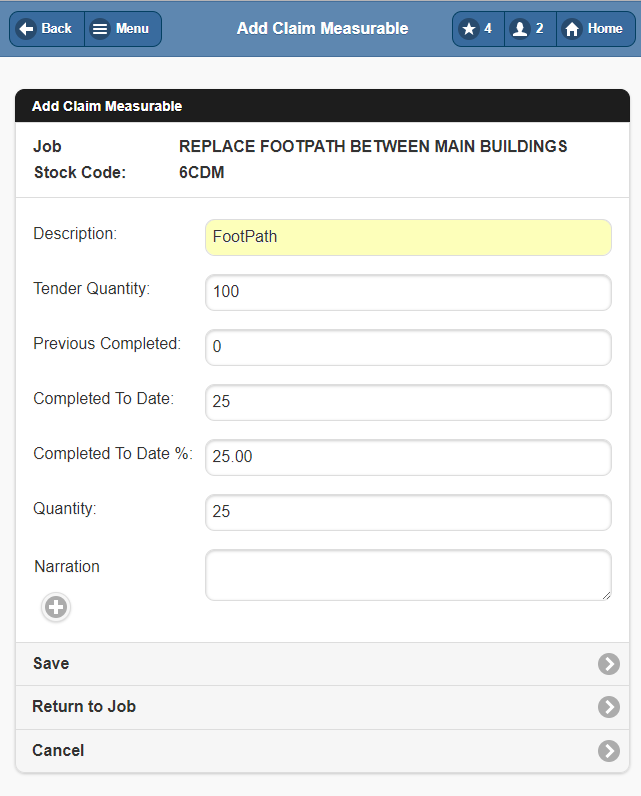 Using the example of 100 metres of foothpath from above - when it comes time for billing, the foreman is able to do a measurement of how many metres of the footpath has been completed, then enter this information into TimeTrak Mobile. This will then allow the person raising the invoice to have realtime updated measurement information from the field to base their progress claim on. TimeTrak allows your construction business to effortlessly invoice for a partially completed job, claiming your deliverables prior to job completion. This process can be completed from anywhere on a mobile with an Internet connection, allowing your team leaders to efficiently record what has been completed to date, without having to go back to the office.